I love the holidays. Ever since I was a kid I have loved this time of the year. I loved it for a few reasons. Obviously, I loved it for spending time with my family and eating and laughing and opening presents, but I also waited all year for one thing. I waited all year for the Twilight Zone marathon. My cousins and I would huddle together around my grandparents’ little television in their basement in West Orange, NJ and watch the New Year’s Eve marathon. One episode, a classic, is titled, “To Serve Man.” In this episode, earth is visited by spaceships carrying a large race of aliens called the Kanamits. At first the earthlings are skeptical of these Kanamits, but as they learn more and more, it seems they come in peace. The aliens shared advances in science and technology. They shared farming techniques and showed real care to the inhabitants of earth. They brought with them a book. This book looked like a Bible or a manual of some sort, but it was written in their language so it required government code breakers to determine what it actually was. The government specialists finally cracked the code and the title appeared to be, “To Serve Man.” What great news! The Kanamits were there to serve! As time progressed, people were boarding ships to go and visit the Kanamits’ home planet. Of course, it didn’t end up as well as they had hoped. SPOILER ALERT: upon further investigation, a government agent runs towards the ship shouting to a colleague that the book was not titled, “To Serve Man.” The book was titled, “How to Serve Man.” It wasn’t a guidebook for selfless living; it was a cookbook! In 1 Corinthians 12, Paul outlines different gifts of the Spirit that equip us for an entirely different way of “serving man”. In his letter to the Romans, Paul uses the word Diakonia (dee-ah-kah-nee-ah) which means administration or service; serviceable labor. This is where we get the word Deacon. I never thought I had much to contribute. When I heard service, I thought missions or full time ministry. Growing up in the church not feeling like I had anything to give felt awkward. I learned over time that service did not necessarily mean hopping on a plane and jetting over to Zimbabwe to feed orphans or build a hospital. That may be what it means for some of us, but not for all of us. I learned that giving of your time as well as your finances and talents are service as well. I have played worship in corporate gatherings for over seventeen years. I have taught VBS classes, been a day-camp counselor and spent some time among homeless individuals in Florida. Without realizing it, I had been serving through the power of the Holy Spirit! You may not feel like you are serving, but service does not look the same in everyone. We cannot all be feet and we cannot all be hands. We are not all international missionaries and we are not all called to preach sermons. The same way that there are many gifts but one Spirit, there are many parts but one body. Each of us has a part to play in the body of Christ. If you sit back and consider what Christ is doing in your life, you may find that you are serving in ways that you did not even realize! If I were to describe my talents I’ve been given in life, I would say I’m the quintessential example of a “Jack of trades, master of none”. In other words, growing up, I tried out everything! I played sports all year round, took up piano lessons at an early age, sang in my high school and church choirs, was academically-minded and took all the honors & AP courses I could. But I can’t say that I was ever the star athlete, the child prodigy at piano, the lead soloist at my school plays, nor was I the valedictorian of my graduating class. These were talents and truly gifts that God had blessed me with over the years. Playing sports allowed me to stay healthy and active and make great friendships. Singing brought me such great enjoyment and allowed me to volunteer in my church choir every Sunday evening. Taking challenging courses allowed me to go to a good college and get the job of my dreams: teaching math! And playing the piano allowed me the opportunity to volunteer to play at church services for many years, and still today I am able to serve at Restore in this capacity! Paul notes, not only are there a variety of God-given gifts amongst his people, but that they are given freely for the common good. We are to use our talents and gifts to help serve others, but most importantly to bring all the Glory to God. We are blessed in Restore with great leaders and church officers, with a growing children’s ministry, with a group of talented musicians, tech team, clean-up crew, and so much more! Have you asked yourself, how can I use the talents or gifts that I’ve been given to help serve others and to give selflessly of your time? I know that, as busy and hectic as my life can get at times, making time to serve always brings me an inner joy that I can’t explain. Think about it in this way: if the women and men who volunteer weekly in our children’s ministry didn’t give of their time week by week, then our families with young children would not be able to worship Jesus the way they so freely enjoy. If our worship team didn’t give up a few hours of their Thursday nights and Sunday mornings each week, you wouldn’t be able to shout out with a joyful sound each Sabbath to the music as we so freely do now. If the leaders of our church didn’t oversee every small and large detail of our family of God, our services and ministries would simply cease to exist! If our tech team didn’t show up each Sunday to serve, families who watch Restore via Livestream would no longer have this gift. When you look around church on a Sunday morning, think about the fact that, somebody did this, somebody gave up their time or their talents to make this happen! How, then, has the Holy Spirit moved you to help serve and use your gifts to serve others for the common good? How are you using your spiritual gifts to bring Glory to our Great God? When I think about the gift of service, I think about our church community. Restore is more than a church in a community. Restore is a community of believers that have a heart to serve others. To be a servant is to be like Jesus; through our serving others we are also serving Christ and making our relationship with Him our primary concern. As a part of the Restore community we have experienced the joy of intentionally looking for opportunities to share the Good News of the Gospel through serving others without expecting anything in return. Often when I have been presented with an opportunity to serve I can usually come up with a list of reasons (excuses) why I can’t. Something else on my schedule. I don’t have the resources. I don’t have the energy. And on and on. Yet, there has never been a time when I was not happy I served when I was finished. It’s true: you will definitely feel good after serving someone else, even though it’s not about what you get. (I can go to a good restaurant if I want the service to be all about me!) Our motivation is not what we get out of it; our motivation is the example of Jesus himself, who came to serve and not be served. The possibilities for service are endless and so is the lasting impact, wherever it may be. As part of Restore we have provided rides for the elderly to attend the annual North Haledon Day Picnic and are often asked where we are from and why we would volunteer to do this for them. We assist with traffic control for the annual town 5k and get to see first hand the appreciation from all the runners and event organizers (who again ask us why we are volunteering to do this!) We’ve served hundreds of people a southern style meal of catfish to benefit Cary Christian Center in Mississippi and were able to hear the joy and gratitude from the people ministering there. Some have mentored kids through New City Kids in Paterson and have opportunities to tell the young children that they see potential in them. Recently, many of us have given Angel Tree gifts for New Hope Ministry in Prospect Park, and although we will most likely never see the excitement on the child’s face when they had that gift to open for Christmas, we still know that it meant a lot to them and their family. Once you decide to no longer be a spectator on the sideline and choose to become a participant in serving, you quickly see that it is not about what you can get out of serving others but what you can put into it. All of us can have a positive impact through serving that in turn leave someone’s situation better. Everyone can serve someone. The only thing getting in the way is being consumed with ourselves. Paul knew that Jesus didn’t make mistakes with the people that he came to save. The Corinthians made him question it a little bit, though. Here they were: affluent, gifted, talented, smart…and yet they were also pretentious, prideful, immoral, ignorant… How could people who had so much be so silly? He had been getting reports that, just like everything else in their life, they assumed that the end result of their salvation was really about them. The same principle they applied to “their” money, to “their” pastor, to “their” job, to “their” abilities–namely, that it was all for their own benefit–they now applied to their spirituality. Jesus had saved them, and now they were locked in a game of one-upsmanship to see who had received greater gifts. Their gatherings were becoming less and less about the Jesus who saved them, and more and more about the people he had saved. They would walk into the house where they worshipped and you could see it in many of their faces: these people should be really glad that I’m part of this community. They are lucky to have me. Why did they always seem to come so close to getting it, just to get it twisted in the end? The people in the church should be glad to have each other, but luck had nothing to do with it. Neither did the credentials of the person themselves. Rather, the reason that they should be glad that each of them were part of the gathered body is because the Holy Spirit had given each of them special gifts that would allow them to make a contribution for the greater good. Didn’t they see it? They had each been called to serve and care for one another! Everything that they had been given was for the common good. That was the example of Jesus, after all. He had laid everything down so that they could be saved and really learn to love one another, selflessly, truly. Now, they were to continue that call and live as the embodiment of sacrificial love to one another. That’s why they were given these “gifts” that they were so proud about. It wasn’t so that they would be proud; it’s so that they could humbly love and serve one another. Oh well, Paul thought. They were never going to get it right, at least not on this side of eternity. They were saved by grace, and he knew it would require more and more grace every day just for them to get through. In the meantime, he’d write them a letter reminding them of how Christ was calling them to live. In time they might learn to see service as a gift to one another. Until then, Jesus still reigned. Every believer in the church has been given specific and special gifts that they are called to use for the common good. But what does that mean? Join us tomorrow in person at 10:30 am, or live online at live.restoreworship.org as we consider what it means to have been given the Gift of Service. As I woke up on my 45th birthday I knew that I had to make one of the most important decisions in my life. One that would change me from the person I was “before cancer” to one that I would become “after cancer”. On that day, I gave myself the most important gift I could: the best chance to live another 45 years. I called my doctor and scheduled my mastectomy. Thankfully, I did not have to make this decision alone because God had given me and all of us a very special gift to help us get through whatever life throws at us. In John 14, Jesus is trying to prepare the apostles for what is to come as the prophecy of His death gets closer. He is telling them that when He leaves them, he will not leave them orphaned, God will provide another friend, the Spirit of Truth, so that they will always have someone with them. I am so grateful that I had that same spirit in me to help me get through one of the most difficult years of my life. It took 3 weeks, but the Holy Spirit stayed with me and helped me make the decision to have a mastectomy. I had three options to consider that caused me many nights of lying awake praying for guidance to make the “right” decision. Thankfully, the cancer was caught early and did not require me to have any chemo. I felt like I got off easy because I didn’t have to go through months of sickness or losing my hair, but I only needed to sacrifice a part of my body. During this time the Holy Spirit was with me; the wonderful thing about of having a friend like this is that I was never alone. I was able to get through every test, MRI, and hospital visit without being anxious, worried or scared. It was truly amazing! The Holy Spirit was there with me every step of the way holding my hand hand telling me that I was going to be OK. Three surgeries and I year later I am happy to be cancer free! “After cancer” Allison is now a very different person. Just hearing that C word made me stop dead in my tracks and caused me to reevaluate my life. It made me change how I viewedall aspects of my life; family, friends, work…It was a wake-up call for many areas of my life. I felt like the Spirit was Cher in “Moonstruck” when she slaps Nicolas Cage and screams, “Snap out of it!” I needed this wake up call to prepare for what was to come, for the new plan that God had for me. I probably would not have listened if it weren’t for the Holy Spirit being right by my side. One of those wake-up calls for me was the stress related to my job. I had taught in the public school system for the previous 17 years and I can honestly say that I loved going to school every day. Unfortunately, the job also came with a great deal of stress with curriculum changes and increased regulations and requirements. I had seen research that showed links between cancer and stress, and I needed to eliminate some stress from my life. That year I prayed non-stop for guidance on what I was going to do if I left teaching. I considered going back to school for something totally different–hair stylist, massage therapy for cancer patients, accountant so I could work for my husband’s company–but nothing seemed right. I read books, looked online, and prayed and prayed and prayed for some sort of sign or clarity about where I should go. And that’s when I had another “Snap out of it!” moment. A meeting with the principal of Eastern Christian Elementary School about math curriculum turned into an aside about a position opening in the 3rd grade the next school year. As soon as I got into my car, I could hear the Holy Spirit’s voice: “This is it! This is what you were praying for! You don’t need to go back to school, or do something different. You can do what you love, and what you were meant to do.” About a year had passed from the day I heard the most devastating news of my life to the day I signed my new contract. I have been teaching at ECES for 3 months and this, too, has been a gift from God. There have been so many wonderful ways that this has made me a better person and teacher. Most importantly, I have grown closer in my relationship with God. I get to praise Him and pray every day with my students. My Monday devotions with staff is so amazing, I don’t know how I have gone through life without it! I get to participate in Chapel every Tuesday and witness God’s children praising Him and learning about His word. Every day I witness and see the power of the Holy Spirit in my students, my colleagues and myself. Looking back, I don’t think I would have listened to the Holy Spirit whispering to me if I hadn’t had cancer and taken time to reevaluate my life. I was usually caught up in “life” and didn’t take a lot of time to stop and listen. And the truth is, I wouldn’t have gotten through any of it–through cancer, tough decisions, and bold career moves–without the Holy spirit guiding me and being with me every single day. This is the best kind of gift! The kind that doesn’t cost a thing, keeps on giving, and most importantly is a gift from God. During this season of Advent, take time out of the hustle and bustle of buying and wrapping gifts and spend time listening to one of the greatest gifts that you were already given: the Holy Spirit! "And when they bring you to trial and deliver you over, do not be anxious beforehand what you are to say, but say whatever is given you in that hour, for it is not you who speak, but the Holy Spirit." Working in an environment where you are one of few Christ-followers can be very difficult. In our culture, I am taught to stick to my own beliefs and respect other's differences. At church, I am taught to share the Gospel, advance the Kingdom, and plant seeds in people's lives. I wrestled with this for awhile until I decided to try to show my love of Christ to my coworkers and see what would happen. I spent so much time stressing over what to say and how to say it. I worried about people treating me differently if I spoke about the Lord too much and often wondered how to approach conversations in a Christ-like fashion. I learned years ago that the Holy Spirit lives inside of me, but I never fully understood what that meant. Many of us are like that; we live our lives hearing what we're taught, but it's not until we experience it ourselves that we are transformed. Honestly, I was so consumed with figuring it out on my own I forgot about the Spirit. That is, until fall of last year. Last October, my friend and coworker, Aubrey Pappas, was tragically killed driving home from school. She was 5 months pregnant with her second child. When a person experiences sudden grief, the mind goes blank. It's such a shock that the words have trouble formulating. Usually, going to work helps distract the pain and momentarily takes their mind off of the suffering. But when that grief is joined by 120 other coworkers and 1,000 students, it's hard to escape it. I knew going to school was going to be very difficult. I knew that there were coworkers that have known her for years and were going to need support. But what do you say in a public school where practicing religion is not allowed? "...for it is not you who speak, but the Holy Spirit." That first morning back, Substitutes were placed on standby to cover our classes if we needed to leave the classroom. I managed to make it through first period, but once second period started, a phrase kept going through my mind. I kept thinking, "You need to find Laurie. You need to see if Laurie is okay." I found myself leaving my room and following my coworker, Laurie, through the halls all morning while she checked on Aubrey's former students. Laurie and Aubrey had been teammates for 10 years and shared the same kids. In that moment, I had no control over what I was thinking or doing, all I know is that something inside of me told me Laurie needed me by her side. I remember crying the entire way to school. I remember crying during homeroom. But when I was with Laurie, I was so focused on getting her water, making sure she ate, following her as she hugged her students that I don't remember my own emotions. I kept thinking, What am I doing here? These aren't my students. This is so painful watching the kids react. Laurie is fully capable of doing this without me. But I couldn't leave. The Holy Spirit does amazing things in our lives. Last week, I met Laurie for dinner and we found ourselves sharing memories of Aubrey. Out of nowhere she says, "You know, that morning after, when you were with me, every time I started to crumble I looked over and you were right by my side. You gave me the strength to be strong for the kids. I will never forget that." In Mark 13, Jesus is explaining all of the situations that will happen to the disciples before He returns to Earth. Jesus tells them that many people will put us on trial and expect explanations of our actions, but to not fear because the Holy Spirit will speak for us when that time comes. I believe that the Spirit not only helps us during times of trouble, but throughout our every day lives. Losing Aubrey was devastating. At first, I had no idea how the school would be able to function without her. There are still some hard days among faculty members a year later, but I no longer stress about what to say to them. I've learned that God has a secret weapon that can be so powerful and purposeful, and I am simply a vessel for His word. God doesn't expect us to always know what to say or do in situations, because it's not about us. It's never about us. He knows what needs to be communicated and how to help us. He wants to help us so much, He put the Holy Spirit inside of each and every one of us! It is one of the most amazing gifts we will ever receive, and we need to use it more. That gut feeling you have? That voice inside of your head? Those aren't you. That's your Helper, the Spirit; and He's telling you that you are not alone in this. Here is a prayer you can pray every day to remind yourself that the Helper has been sent to you: Heavenly Father, I pray that moving forward, you will allow your Helper, the Holy Spirit, to speak and act for me when words come up short. I pray for opportunities for the Spirit to show through, use me as a vessel for your good. Amen. I was in my early twenties, sitting in a conference with a bunch of other Youth Pastors, listening to Andy Stanley speak on leadership. I’ve never forgotten what he said. In talking about organizational change, he said that every person–and every decision–has a certain risk quotient. As it relates to people, he meant that every person is wired differently and a decision that may seem perfectly clear to one person may seem overly risky to another; we are all hard-wired to need a certain level of information before we can make a decision, and that level varies based on the individual. Of course, the decision itself can also affect the risk-quotient. Big decisions require a significant amount of information in order to limit the risk; on the other hand, we may make small decisions–like driving to a store just to check if something we want is “in stock”–without much concern for the risk at all. Even if the store doesn’t carry what we are looking for, there wasn’t much loss associated with the decision to drive out and check. Several years after hearing that talk on leadership I was asked to take a test as part of my assessment for church planting that would indicate my level of comfort with taking risk. The results came back, solidly in the “average” territory. What I’ve discovered over the years is that for me to be comfortable with a decision means that I need a reasonable amount of information before making a choice. I’ve made what others may consider to be risky decisions, but as far as I was concerned, I had all the information I needed. My desire to have just the right amount of knowledge, mixed with just the right amount of certainty, means that I am not typically swayed by how I feel about something in the moment. Unfortunately, it also means that I am not typically swayed by things like “the Holy Spirit’s voice”. If the Holy Spirit wants me to make a risky decision, he has one of two choices, as far as I’m concerned: either he can give me the knowledge and the certainty, or he can make it so obvious that it’s Him that I’d be a fool to resist, even if I don’t know how it’s all going to work out. It’s that second one that scares me, and it happened to me on January 31st, 2010. Christi and I were visiting a rag-tag group of people in North Jersey who were trying to have a church service together and just needed people to preach. We didn’t know what to expect. Our life was recently in disarray. We had entered the New Year looking for new opportunities, trying to determine where God was leading us. We thought we were supposed to stay in New York State, where we lived, near family. I hadn’t preached in a while and was nervous. I had slept on a friends floor the night before. I had to drive through Dunkin' Donuts because there were no Starbucks on the way to the church. It was rough. The service ended up going fine, but it’s what happened afterwards that changed the trajectory of our lives. And we knew we were supposed to be at Restore. At that particular moment, the “risk quotient” of making a decision like that would have been the equivalent of “foolish”. We had…one percent, two percent?…of the information that we needed to be able to say that this was where we were supposed to go. But the voice of the Holy Spirit was unmistakeable: just call them and see what happens. And what a gift that is. The Spirit, dwelling in our hearts, prompting us forward to obey God’s call on our lives, leading us into joy. That gift is worth the risk any day. Some years ago, my passion for horses found me riding several days a week at a stable near our home. During my hours there, I became friends with an older man named “Jerry” who served as a general caretaker and repairman around the property. Jerry was a gentle soul and mostly kept to himself, but over time we had some fairly meaningful conversations, some of which occasionally veered into topics related to religion. Jerry’s religious background included an upbringing within a very stern Catholic culture, and it became clear that he still struggled with issues of guilt and reward. For the most part, I listened to his stories and laughed with him, and tried to share some “Reformed wisdom,” even while I wasn’t sure how much he wanted to hear or, for that matter, what more I could say. During those years, I was also involved with worship planning activities at our church. For one particular sermon series, our pastor was going to be patterning his messages after Phillip Yancey’s book “What’s So Amazing About Grace?” and those of us on the planning team were encouraged to read it as well. It was the week of one our planning meetings, and I had fallen a bit behind in my reading; I still remember sitting up late on a Wednesday night trying to get caught up, power-reading through chapter after chapter about the incredible scope and power of God’s grace, available even to those who by societal standards seem so undeserving…Jeffrey Dahmer…members of the KKK…Nazi soldiers who partook in the holocaust…the thief on the cross…how Mother Theresa needs grace as much as each one us and God does not grade on a curve. And guess what, I had unknowingly crammed for this “examination” just 12 hours earlier, and I knew just what to say, illustrations and everything! For the next 30 minutes, I am certain Jerry heard exactly what he needed to hear about grace and I could answer every question he threw at me. God had a plan to share His good news with Jerry, and prepared the road that led to the conversation on that Thursday morning, equipping me with both the content and confidence I needed. The same Holy Spirit that was poured out on the disciples has been gifted to each and every true believer, what awesome power lives in us! So go boldly into any situation that God may lead you; you’ll not face it alone! I heard a wise man say, “In my life I have had many careers, but only one job: displaying the good news of the Gospel.” Powerful words, but what does it mean? Paul writes to the church at Corinth and tells them that the more they serve, the more they will find themselves privileged to do so. When we are activated in our faith, the Holy Spirit moves in us and we are given gifts. There are many different gifts that all come from the same Spirit; all of us were given the Holy Spirit as an Advocate and Helper. What we have to discover is what that means for us in practical, everyday life. Have you ever felt ill-equipped for a task? Do you ever feel like you don’t have what it takes? All of us have experienced that from time to time. The good news is, you are equipped and you CAN do it. Max Lucado wrote a book titled, The Cure for the Common Life: Living in your Sweet Spot. In his book, one of the main illustrations is that each of us have been given a back pack full of all the tools we need to live a life sold out to Christ and equipped for every task. We are often tempted to covet someone else’s bag of tools. We may feel that our kit is inadequate. What we are taught in the Bible, however, is that the Holy Spirit has given us the gifts pertinent to our individual task and therefore, our kit is exactly what we will need. The Holy Spirit decides which gifts each of us should have. We are responsible to use and sharpen our gifts, but we can take no credit for what God has freely given us. So what are your gifts? They may not always be obvious at first. Sometimes they may even seem like a weakness or a negative. I’m reminded of our left-handed friend Ehud from the book of Judges: what men may see as a deficiency, God can use for victory. As far back as I can remember, I had a very deep voice. Even as a child, I sounded pretty much the same. I remember people calling our house phone and, inevitably, someone would say, “Jim? Matt?” Lovely. I will never forget the first time I heard my voice on a recording. I almost outright vowed to never speak up in class again. The only problem with that? I LOVE to talk. I am social and a people person to the core. When it was time to figure out what I wanted to major in, in college, I decided to use the thing I had previously felt most self-conscious about: TALKING. I majored in speech communication with the full intention of going into radio. Clearly, that was a career using your VOICE. After a short stint as a DJ at our college radio station, coming back to the NY/NJ metro area was a smack of reality. I didn’t ever get that job in radio. After a few years working in Manhattan, as an assistant property director, I had the opportunity to make a major switch to the non-profit world. A few months earlier, in the basement of one of our buildings in Manhattan, I had asked God what He wanted for my life…how He wanted to use my gift of speech. Out of nowhere, I felt a strange pull towards a faith-based Crisis Pregnancy Center. Talk about feeling ill-equipped! I had never been pregnant, had done my best to follow the ‘rules’ of what was appropriate before marriage (cough) and had ZERO knowledge of what these women were going through. But, nevertheless, the pull was great. It was clear to me that this was a Divine pull. I walked into that new role with great fear and trembling. I became the Director of one of the Crisis Pregnancy Center’s urban locations. The first time I went into the counseling room to counsel a pregnant teen was the most inadequate I’ve ever felt in my entire life. What was I going to say? How would I reach women who’s lives were so very different than mine? How would I bridge cultural, ethnic, and LIFESTYLE gaps with only my words? It wasn’t long before I realized I was doing all I had ever dreamed of doing…using my words to bring life (in a very literal sense in this instance!) Each time I left a counseling room and had touched a life, I felt God ALL over it. Somehow, He was giving me the ability to speak the words that woman needed to hear. It certainly was not me. It was the Holy Spirit, being my ultimate Helper. That time in my life has ended for now, but what I’ve noticed is that even when your position in life changes, the theme and gifting of your life does not. God uses us, mere vessels, to be His hands and feet, each of us with specific gifts. Never feel inadequate. The Holy Spirit is our Advocate & Help. What do we have to fear? “I’m leaving”, Jesus said to his disciples. They looked at him incredulously, waiting for the punchline. Waiting for him to explain it to them, in the way that he always did, when they were confused by something he said. Sad? Maybe. Scared? Definitely. Confused? No question. If Jesus was going to leave them all–and where was he going anyway?–then what was the point of having followed him all these years? What was all this talk about the Kingdom of God, if Jesus was leaving? The disciples stood there silently waiting for Jesus to finish his thought. The disciples still didn’t understand what Jesus meant, but they trusted him enough that this simple promise gave them hope. Soon enough, Jesus really was gone. They had walked through the darkness of his death, rejoiced with him in his resurrection, and now they stood, staring up into the sky, where Jesus had just ascended into the clouds. He had said it again: I’m sending you my Spirit. It wouldn’t take long until they understood–not just in theory, but in experience–what he actually meant. They were gathered in a room, praying, waiting on God, when the Spirit finally came. It was more powerful than they had anticipated. They were driven from the room. The people in the courts of the temple were shocked when Peter, a lowly, uneducated fisherman, stood up and began speaking in a way that they could all understand. The crowds of people from all over the earth listened as Peter told them about Jesus, about his life, his death, and his resurrection. About how Jesus was the one who was promised. And, sadly, about how Jesus was the one who was crucified. Every person who follows Christ has been given the same gift of the Holy Spirit that compelled the disciples to face their fears, go outside, and begin preaching the Gospel. But what does that mean? Join us tomorrow in person at 10:30 am, or live online at live.restoreworship.org as we consider what it means to have been given the Gift of the Holy Spirit. Is the desire for righteousness a bad thing? Shouldn’t our actions be so good and above reproach that people will notice and wonder what makes us different? While James 2 states that that “faith without works is dead”, in Isaiah 64 we are told that all our righteous acts are like “filthy rags”. Of course, we can’t just grab Bible verses for our own purposes without understanding context, the writer, the audience etc., but this type of contradictory language is pervasive in the Bible. Jesus curses the tree that doesn’t bear fruit, but tears apart the Pharisees for parading their prayers and actions to make themselves look good. This has always been a difficult balancing act for me. I can quickly fall into the trap of feeling good about my own “works”, but it shouldn’t be an issue. Sure, my feeble attempts at “righteousness” are not a bad thing, in and of themselves. We are taught to use whatever gifts we have for the kingdom. What I need, though, is to go back to the same things I have taught over and over to high school kids in catechism class: Salvation comes before service and grace comes before gratitude. Remembering that both salvation and grace are gifts that are not contingent on anything I do gives the proper motivation for doing my best to serve in any way I can. The gift of righteousness is just one of many layers of the ultimate gift in the form of Jesus Christ that we celebrate at Christmas. It is not a reward, a bonus, a prize or a participation award for what we do–or for even trying! It is a gift that has been bought and paid for only through His life, death and resurrection. He stands in our place. That is the only way we become truly righteous before the Father, and it is all we need. More often than not, the aspect of this gift that I need the most is forgiveness for when I start feeling that I am doing a pretty good job on my own. We all need to be reminded that this gift is constantly offered to all of us not only during this Christmas season but all year long, regardless of how we are doing in our own quest for righteousness. We need only to accept it through faith in the One who gives it. Then we can begin to serve with gratitude. When I graduated from college, I applied to a teaching program in the inner city, and I was accepted. I knew almost immediately that teaching in the inner city wasn’t for me. But I was stubborn. I was convinced that if I just pushed myself hard enough and worked really hard and prayed a lot, I could succeed. I was wrong. No matter how hard I worked, no matter what techniques I tried, no matter what shiny new classroom supplies I armed myself with, I could not succeed. And I had no idea what to do. I had never before failed at something I had truly wanted to succeed at. Several months after I quit, one of my friends suggested I apply for a teaching job at a school I had attended in middle school. I ignored his suggestion, dismissing it as ridiculous. Didn’t he know I couldn’t teach? The past year had definitely proven that. A few days later, the school’s principal called me, told me my friend had informed him that I needed a job, and asked me to come in for an interview. I was shocked. I knew, I knew, I was a terrible teacher. Why would they want me? I went in for the interview anyway. And miracles of miracles they hired me. The strangest thing happened that year: I fell in love with teaching. It brought me such great joy, a joy made all the stronger by the experience of my previous failure. I had done nothing. In fact I had often done the opposite of what I should have done. And yet, God gave me this incredible gift; He gave teaching back to me. And He did it entirely separately from my own efforts. Such is the gift of Christ’s righteousness to us. Nothing done in our own power can make us right with God. The strongest, the wisest, the most passionate cannot bridge the gap between their sin and God. But Christ’s strength, goodness, and uprightness is more than enough, and He has given us this righteousness as a gift. There comes with this gift a sweet, a blessed relief—relief that inevitable failure has become guaranteed success. But alongside that relief also comes a delight. We know that we won’t just succeed, but our success—Christ’s success—will be spectacular. For American adults, many times gifts = chores. My favorite example of this is the gift card exchange. I hate gift card exchanges. Hate. Gift Card. Exchanges. To me, the idea essentially boils down to, "Hey, let's all put absolutely no thought or effort into this activity. We'll all put the same amount of money into the pot, and we'll all receive the same level of gifts out of the pot." It's like some sort of bizarre expected gift giving/receiving socialist manifesto: "To each according to his $20 Best Buy card to each according to his willingness to receive a $20 target gift card." And we're all scrambling for the Best Buy card- let's be honest. There are several times in gift card exchanges that I've walked away... HAPPY!... having claimed my own gift card. "At least I got my card back." What type of giving is this activity really?! We could all save time and headaches by sitting in a circle, taking $20 out of our pockets, passing it to the person on our right, and sitting back down. For the Bible (and the dictionary), gifts = grace. Gifts are expressions of love given without the need or ability to pay back or return the favor. What does it mean when we say that "Righteousness is a gift from God?" It means that righteousness- being right before God- can only come from God. We can't do it ourselves because we're sinful to our cores. Many of us are familiar with the Total-Depravity-trumpeting verse, "For all have sinned and fall short of the Glory of God," Romans 3:23. I always remember the "partner verse" to that one found just 3 chapters later: "For the wages of sin is death, but the gift of God is eternal life in Christ Jesus our Lord. (Romans 6:23- emphasis mine). Wages are things we earn. We actively work towards that goal. When we work at our jobs, we expect the compensation that we're working towards. We deserve it. We've earned it. According to the Bible, we're actively working away from God and towards death. Gifts, on the other hand, are, by definition, things we can't earn and don't deserve. And what is this gift that God has given us? Righteousness- we are right with God through the sacrifice of Jesus Christ on our behalf. Completely unmerited favor. A perfect Gift. Perfect Grace. So when we have these arranged giving scenarios in modern day American Christmas, the habits of Christmas can rob the idea of gifts that is so central to the holiday. I knew I was getting the Sega Genesis, but I didn't earn it. How many people would be upset if, at a $20 gift card pool, I brought a $5 card (or for that matter, what type of fights would break out if I brought a $200 card?!?!). Both of these scenarios have "gift expectations," which robs the "unmerited grace" concept behind giving a gift. This Christmas season, my prayer for us is that we will remember anew that gifts aren't mindless, habitual, chores. In fact, the greatest Gift ever was given this season and changed the world. And just like truly undeserved, amazing gifts that we've ever physically received in our lives, the best authentic response to receiving something so amazing that we don't deserve is joy, thanksgiving, and sharing. May we all treat our true Gift that way this Christmas season! Be joyful. Be thankful. And don't keep it to yourself. Tell the story behind that amazing Gift you received that you didn't deserve! Everyone I know, including myself, has hit a brick wall at some time in their life. Whether it be a career, personal relationship, or health issue, we have all come to a point where we realize we are not in control. We cannot do it on our own. My brick wall professionally came in 1993. I have the privilege of serving as the Director of Bethany Christian Services. Bethany is an adoption and family service agency which started in New Jersey some 55 years ago. In 1993, however, we only did a few adoptions. My secretary and I were the only two employees in New Jersey. I did not know how the ministry would continue. There was a moment when I held out my hands to God and said “God, please take away my anxiety. Please take this agency, as it was never mine. It is yours. Please do with it what you will”. Putting this in God’s hands was so liberating! My anxiety was miraculously gone, and God has done some amazing things. Since 1993, He has seen fit to have us establish offices in Manhattan, Rochester, and Albany, NY, and one in Danbury, CT. We have completed hundreds and hundreds of adoptions, placing children in loving Christian homes. I have been privileged to work with birth-moms and dads who have voluntarily surrendered their children for a better life then they were able to provide at that time. I have witnessed sacrificial love beyond my wildest imagination. How does this relate to righteousness, you ask? God is completely righteous, and I can do nothing without Him. All that I am and have is a gift. My salvation, my very being, right down to my breathing belongs to Him. In that moment in 1993 I surrendered my “professional” will to God, and He gave me treasures I could never imagine. He does the same thing with my righteousness every day as I surrender my claim to my own righteousness, and embrace what he Has already done on my behalf. Righteousness is a free gift, given when we are completely empty, unable to do anything but lift our hands up to God. We earn nothing, but in Christ, we receive everything. That is the good news of Christmas! Just over ten years ago, my wife, Ruth, had a crisis of health. You may have already read Ruth’s story in the previous devotion–now as Paul Harvey would say–Here’s “the rest of the story”...or at least another part of it. When Ruth was diagnosed with cancer, it was one of the most devastating days of my life. The voice of the intercom echoed throughout the cavernous, oversized waiting room at Memorial Sloan Kettering Hospital. I walked slowly to the receptionist and she handed me the phone. It was the doctor in the operating room. “Mr. Kuder- I have not so good news and not so bad news. Which do you want to hear first?" The not so good news is that it is cancer, the not so bad news is that it is not aggressive. It is a tumor type that is slow growing and the cure most often is surgery. Considering your wife’s age, and the fact that you have children, I suggest that we take a radical approach to her surgery. My heart and life fell through the floor. There I was, standing alone in the waiting room having to decide Ruth’s future and a “scenario” that we did not discuss in all of our pre-surgery meetings. I prayed for wisdom and had about two minutes for that wisdom to arrive. I decided that giving Ruth the best chance at living a longer life was better than risking a less radical surgery and a greater chance that the cancer would return. The next time I would see Ruth, was something that I will never be able to remove from my memory. She was in such pain and I felt so helpless. As Ruth lay in the recovery room, every few minutes a tortuous grimace came to her face. Why would God let this happen? Who deserved this? I thought about Jesus’ suffering and death on the cross, but it didn’t matter. In the weeks ahead, as Ruth’s condition improved, mine got worse. Instead of being grateful that God had spared her life and had begun to restore her, I became increasingly angry with God. I resented that God had chosen her and me for a Job-like experience. My spiral continued until a few weeks into Ruth’s recovery when we had a scare that required us to go to the emergency room at Sloan Kettering. Wasn’t it enough that God had put us through this in the first place, but now there were going to be complications? This is where my healing began. Who was I that I could be mad at God? My self-righteous notions of earning or deserving God’s grace or of being inoculated from the physical effects of sin were misplaced. Were the other patients: young fathers, mothers and children in the Sloan emergency room that night less deserving of God’s grace? The brokenness of our world illuminates how sin impacts every area of our life. Romans 3:10 says, “There is none righteous. No, not even one." Our righteousness cannot be earned or deserved. It has already been obtained through the life, suffering, death, and resurrection of Jesus Christ. “But he was wounded for our transgressions, he was bruised for our iniquities: the chastisement of our peace was upon him; and with his stripes we are healed” (Isaiah 53:5). There is always a temptation to think that we are good enough, but Immanuel has come in order that we could receive the gift of righteousness through faith. Part of the reason that they joined Jesus’ little group was because no one else wanted them. They didn’t have the same credentials, background, or education as the religious elite, the “Scribes” or the “Pharisees”. In day school, they were passed over by all of the rabbi’s who were looking for pupils. They weren’t qualified for the most honored positions of the day. But now each of them had a story. Jesus had come by where they were working, looked directly at them, pointed them out of the crowd, and said, “follow me”. And they did. This new rabbi–rebellious, different, loving, humble, powerful–he *wanted* them. It didn’t matter what anyone thought of them in the past, what mattered was what Jesus thought of them in the moment, and he had called them his followers. It felt like another rejection. Their deep fear that they weren’t really good enough, that the other rabbi’s were right, that the Pharisees who looked down their smug noses at them were seeing things as they actually are, had been confirmed. We don’t measure up. If we have to *more righteous* than the *most righteous* people we know, what hope do we actually have? Perfection is the standard. You must be perfect. Jesus said again. It was hopeless, they thought. I’m hopeless. Yet Jesus would turn their sorrow to joy, as he always did. The bad news would quickly become good news. The bad news was that perfect righteousness was the standard; the good news was that Jesus was going to give them what he earned. Jesus would provide the credentials necessary to enter into the kingdom of Heaven. Perhaps you’ve felt like you don’t measure up to God’s love. Perhaps you’ve been living under the burden of religion that says, “do more, be better, try harder” for God to love you. Maybe you’ve been trying to muster up enough courage to come to God, just so you can make an excuse about all of your perceived failure. The message of Jesus is that none of that matters anymore. The righteousness and perfection that God demands is given to us by Jesus, precisely because it is something we could never earn. And that is really good news. Tomorrow we will explore more about what it means for us that Righteousness is a free gift because of Jesus. Services are at 10:30 and you can watch live online at http://live.restoreworship.org. All of the sermons from the "Christmas Gifts" series can be found online here. Grief comes in waves, and this was a big one, threatening to crush me and drag me under. Fear, shame, disbelief, hopelessness, and tears. The overwhelming circumstances magnifying the weakness of my flesh, the doubting in my spirt, the anxiety in my mind. A baby in my arms, a toddler at my feet, three little boys running through the house, my dinner preparation interrupted by the phone and doorbell needing me simultaneously. In a moment of frustration and anger, I held up my wooden spoon in the air and yelled to God, “If you are going to be a Father to the fatherless, now would be a very good time to start!” And, as if just waiting to be invited, God’s presence filled my little kitchen and brought me to my knees, sitting on the floor with my children who had gathered. An unmistakable, warm, weighty blanket of love, comfort, peace to my troubled heart and life. His presence, accompanied by his laughter. It has taken me many years to comprehend and experience the truth of the presence of God. The “I AM” and the “I will” of God that was the answer to my grief that day. The laughter of God that sees a victorious future that we cannot see sometimes. That despite all the facts of my natural circumstances and all the lies screaming in my mind, “You are alone, this is impossible, this pain will overwhelm you, you will be defeated”, the truth remained, as expressed in God’s presence, I was not alone. And, as grace would have it, God didn’t come when we were all dressed up in our “Sunday best”, pretending to have it altogether, saying “I got this God”. He came into my broken, desperate, real life, with a sink full of dirty dishes, crabby kids, torn apart marriage, exhausted body, and broken heart and said “I have you”. The gift of his grace poured out the first time I received Him was for my Salvation. While we were yet sinners God died for the ungodly. And then, His grace poured out again and again every day since that time. In my heart, I sometimes substitute another word for sinners… while we were yet….stubborn, hurting, anxious, fearful, enraged-- His presence, his unmerited, undeserved grace and favor comes again and again. Thus, by God’s invitation to join him, I took my first tentative steps to know and experience God, as Father to the fatherless and the God of all comfort. Countless times, in practical and ordinary, and sometimes extraordinary ways, we experienced the unrelenting love, the fierce protection, covering, and provision of God. And, as I experienced the gift of the presence of God, the answer back in my heart, “It is you, Lord and thank you” a thousand times. And, he had so much more of himself to give and show and teach us about-- so many more ways to express his character. I think of the verse from John 17:3: And this is eternal life that they might know thee the only true God. And, as the years unfolded, in our needs, in our crying out to God, it seemed his pleasure to reveal himself. Need direction? The Good Shepherd. Wisdom? The Wonderful Counselor. Lack? Provision. Grief? Comfort. Anxiety? The Prince of Peace. Sin? Our Righteousness. When I think of Advent two things come to mind, the remembrance of Jesus first arrival as our Messiah, Jesus at Christmas; and what we wait for expectantly now, the Advent of his Second Coming. Yes, but also the Advent—the arrival of God into my heart and life circumstances today. Your Kingdom come, your will be done, your life and grace into this situation today. In the season of Advent, when I hear the Name of God, Emmanuel, my heart resounds with Joy, “Yes, you are with me”. The present of the Presence of God is with me. And to know the love of Christ, which passes knowledge, that you might be filled with all the fullness of God. Just over ten years ago, I faced a crisis of health. And received a gift of faith. I looked forward to the start of the school year with barely contained excitement. For the first time in over a decade, all of my children would be in school all day. I would have 8 hours a day to myself! I imagined a lot of possibilities: cleaning closets, getting in shape and planning a career. An expanding waistline triggered some medical appointments and a gym membership. With 5 children between the ages of 6 and 14, it was difficult to make any arrangements for childcare, so check-ups and work-outs had been difficult to schedule. The first appointment with a doctor turned into an immediate ultrasound, which was followed by an urgent MRI. The medical professionals were kind, but their silence and expressions told me more than any words could have expressed. The expanding waistline was a tumor, not middle-age spread. It was large; the origin was unknown. Within days, I was a patient at Sloan Kettering Cancer Center. The surgery was delayed, hour by agonizing hour. In a hospital gown, on a gurney, I talked with my husband, who patiently, and gently, discussed my worst fears with me. If I didn’t make it through surgery. . . . Who would perform the funeral? Who would care for our children? My worries were consuming. I was worried about the suffering that was ahead of me. It seemed likely that the surgery would be radical, and that the treatment would be painful. My faith reminded me that Jesus, at the cross, has gone before me in all suffering. I was worried that I would die in surgery. My faith reminded me of Psalm 23. “Yea, though I walk through the shadow of death, I will fear no evil”. All of us will die. However, whether through a prolonged sickness and suffering, or through a sudden illness, we will fear no evil, no matter how death comes. I woke up from surgery to my husband’s voice. He had been assigned the task of telling me, that it was cancer, but, that despite its size, it was contained. The surgeon had removed all evidence of disease. I would have to remain vigilant for the rest of my life, since it could recur at any time, as long as I lived, but I was, for now, surgically cured. I received a lot of gifts in the weeks, months and years after that devastating diagnosis. The gift of healing restored me to physical wholeness. The gift of community nurtured me and my family. The gift of brokenness prepared me for more years in ministry for the Kingdom. The gift of gratitude allowed me to celebrate every passing year with delight. 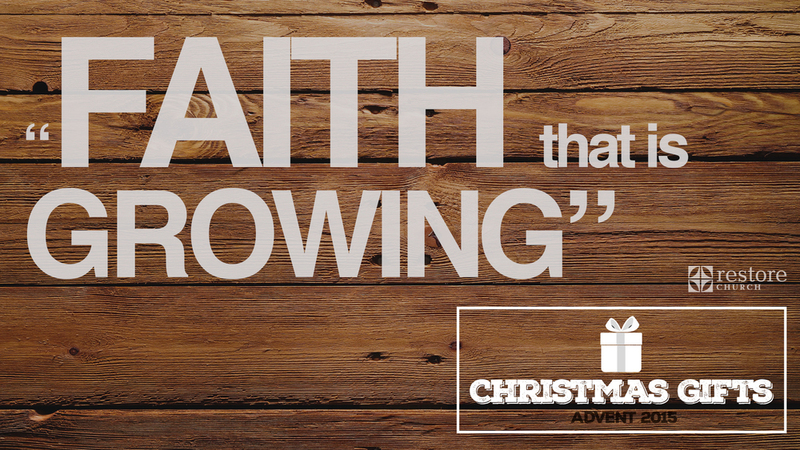 However, the gift of faith trumped them all. For by grace you have been saved, through faith. And this is not your own doing; it is the gift of God. I have heard that faith is like a muscle that gets stronger as we use it. On the other hand, the Bible talks about faith as a gift. What do we make of that? It is evident that some people have been given the gift of faith. These are see God’s will as basic fact; they don’t question what God is doing and don’t struggle with the doubt that many of us seem to. The Bible is full of such people…Abraham, Moses, Nehemiah, and Job to name a few. There are also people in my life who are an inspiration with their faith in God through all sorts of troubles. They never seem to doubt what God is doing in their lives. In my own life, I have seen God’s faithfulness towards me through difficult times, such as when I was unemployed and underemployed for almost 2 years. I questioned God’s purpose for me often, and when I was at my lowest point, and crying out to God for help, He provided the opportunity that got me back on my feet. For me it was a true miracle. And therein lies the connection between faith as a gift, and faith as a muscle to be exercised. The more I’ve gone through experiences in which my faith has seemed to fail, the more I’ve seen God’s faithfulness towards me, building my faith, so that when I got through the experience I would not only see that my faith was stronger, but that it was God’s gift all along. I pray that I can draw on that experience in the future, to continue building the faith that God has given me! Somewhere in the annals of Hillcrest Lutheran Academy is featured the senior portrait of an awkward seventeen year old with the Scripture reference Psalm 62:5-6 inscribed beneath. I still remember the night I “discovered” those verses. I had been perusing through the Psalms, waiting for a meeting to begin in the student lounge of the small midwestern Christian high school I attended, when these words captivated my imagination and gave a steadiness to the emotional roller coaster that was my teenage soul: Strength. Hope. Rest. God is enough. Here was something I could hold onto, words of promise to encourage me. And so like all the other students who had graduated HLA before me, I too had found my Senior Verse. As a parent, I can relate to that desperate dad. When the doctors pulled us aside in the ER to deliver the blow that changed us and our child’s life forever, when life became measured by before brain surgery and after brain surgery / when you could smile brightly and when you no longer could, we realized we have two choices: hold on to God with all we’ve got - doubts, fears, anger, sadness and all; or go it alone. The amazing thing is that in helplessly bringing all our mess to God, in pouring out our broken hearts to him, he proves himself to be all we need, and our faith increases. Our strength. Our great hope. Our rest. Yes, God alone is enough. This gift of faith, tested and tried through suffering, is becoming beautiful and enduring. Genuine. And someday that mysterious connection between faith and suffering will make perfect sense. Until then, I will let these words of N.T. Wright mull around in my brain, “But if we discovered a faith with nothing unexpected or incomprehensible, nothing to shake us from our cozy normal existence and assumptions, we could be fairly sure that it wasn’t the real thing.” Maybe this could be my epitaph. Sign up with your email address to receive the daily devotional directly to your inbox.